Mark – the owner of CLT Quality Air Duct Cleaning – contacted us a couple weeks ago to start on a website. In addition, he awarded us with extra business to create a vectorized logo for him. Our graphic designer completed the graphic a few days ago, but Mark just approved of the website that we created for him. Mark wanted a stylish website that looked clean and gave a fresh feel. We setup all of the pages and added his content. Mark was very pleased with our work and how quickly we responded to his requests. Unfortunately, Mark had a bad experience with another web designer just before he contacted us – and they didn’t give him his domain name nor any refund. BsnTech Networks took care of everything and made the process streamlined. We appreciate the trust that Mark at CLT Quality Air Duct Cleaning placed in BsnTech Networks to create a small business website design for them. 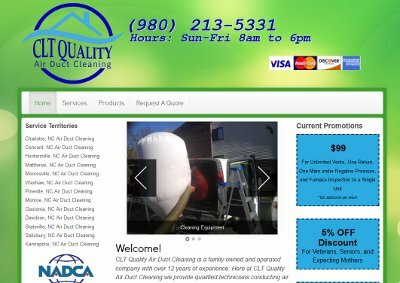 Mark’s website is at cltqualityairductcleaning.